Rating: 6.3/10. From 57 votes. Summary: The description, specs, photo and pricing for the Dan Wesson Specialist pistols. 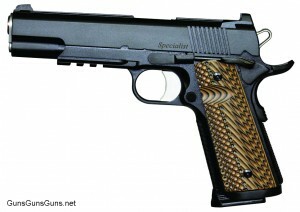 Dan Wesson’s Specialist is a full-size 1911-style semiauto built on a steel frame and chambered in .45 ACP. The company says it designed it in response to requests from law enforcement. The slide wears Dan Wesson’s Clark-style serrated rib and dual-colored tritium night sights. The rear sight is the company’s new tactical ledge rear sight with a single amber tritium dot, and the front offers a green lamp with a white target ring. The forged slide is hand-fit to Dan Wesson’s new forged 70-series tactical rail frame. The frame includes a standard 1913 picatinny rail and features 25 LPI front strap checkering, an under-cut trigger guard and a recessed slide stop for use with laser grips (not included) and tactical operations. Each Specialist comes standard with Dan Wesson’s ambidextrous thumb safety, extended magazine release and a detachable two-piece magwell. It comes dressed with a set of G10 VZ Operator II grips and two eight-round magazines with bump pads. The Specialist comes with a Signature series case and a barrel bushing wrench. It should be available in January 2012. 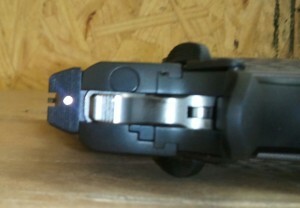 The rear sight, which is made by Dan Wesson. .45 ACP 8+1 5″ 8.75″ 1.45″ 5.5″ 2.31 lbs. This entry was posted in .45 ACP, $1,251-$1,500, $1,501-$1,750, $1,751-$2,000, 1911, Dan Wesson, Full size, Semiauto on November 1, 2011 by Staff. 1) Is it a forged “Stainless” steel frame and “Stainless” steel slide regardless of color? 2) What does the sight picture look like and who makes the sights? 3) When will they be shipping? 4) Who makes the grip safety? – Grip Safety is by Ed Brown. I handled this gun at the 2012 Shot Show and was VERY impressed with it. I have one on back order with my wholesaler(RSR). HOW LONG WILL I HAVE TO WAIT? Are they shipping yet?